On January 2, Saudi Arabia executed 47 men, including prominent cleric and political activist Nimr al-Nimr. This sparked immediate backlash, especially among domestic and global Shiite communities. Unfortunately, such rising sectarian tensions are nothing new in the region. Although the media is quick to highlight the Sunni-Shiite divide, it generally points to this split as the root cause of conflicts. How are we to get beyond this primordialist rhetoric and study the real impacts and causes of sectarianism in the region? POMEPS Briefing 28, “The Gulf’s Escalating Sectarianism,” collects 16 pieces previously published by the Project on Middle East Political Science and the Monkey Cage to provide a more nuanced look of this divisive trend. There is a growing body of scholarship that places sectarianism within the study of comparative politics and international relations, rather than treating sectarian identity as an unchanging, essentialist trait. 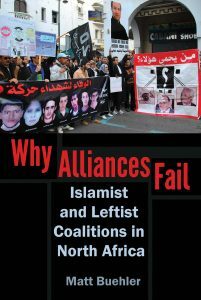 Authors in this collection demonstrate how political elites use sectarian language to legitimize authoritarian rule, consolidate power, and rally against internal and external foes. What appear on the surface as entrenched confessional divides are often more about political and economic power than religion. Interested readers should also look at the 2013 POMEPS Studies 4 “The Politics of Sectarianism,” much of which remains relevant today. Analysis of individual Gulf states’ domestic and geopolitical maneuvering supports this theoretical framework. In Saudi Arabia, the new leadership is able to refocus attention away from its international and domestic failures by increasing pressure on Shiite dissidents and provoking its main regional rival, Iran. And, in the wake of the nuclear agreement, the increasing Iranian influence gives Saudi Arabia another reason to amp up the sectarian vehemence. Meanwhile in Yemen, the labels of sectarianism fail to tell the whole story, while in Iraq and Syria violence in the name of sectarian identity continues to polarize and entrench both sides. The Arab uprisings challenged the traditional regional powers, and Sunni leaders continue to vie for prominence in this new order. Meanwhile, the increasing use of information technology and social media reinforces existing communities, while further polarizing users and citizens. 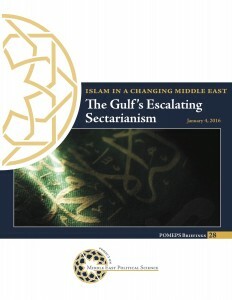 POMEPS Briefing 28 “The Gulf’s Escalating Sectarianism” provides crucial analysis from top scholars on the role of this spiraling sectarian rift in the region.